The last time The Neverly Brothers played an outdoor concert in Palatine was a few years ago, on a Wednesday night. They drew a much bigger crowd to the Fred P. Hall Amphitheater this past Friday for a fun summer evening of vintage rock and roll cover tunes. 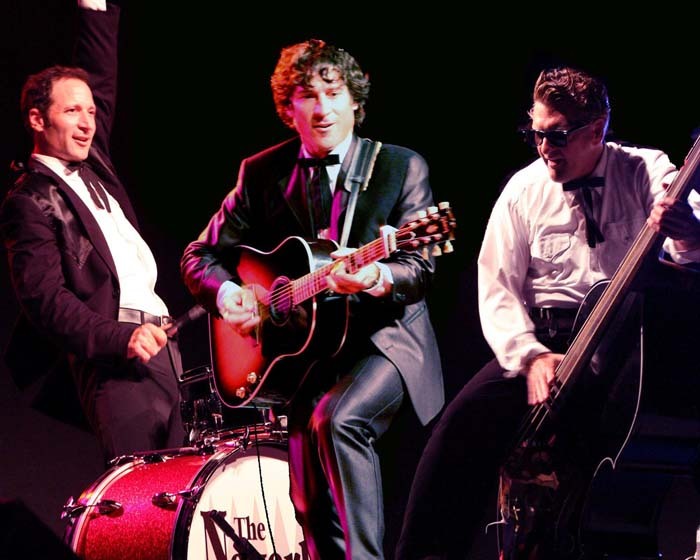 The trio takes a combination travelogue/historical approach, stopping in towns throughout the United States at the times when they gave rise to iconic stars like Richie Valens, Roy Orbison, Chuck Berry, and Buddy Holly. There's also a short segment on the legendary Sun Studios recording session, which features songs by Elvis Presley, Johnny Cash, Carl Perkins, and Jerry Lee Lewis. As the show continues, the focus switches to how British Invasion bands like The Beatles, Rolling Stones, Kinks, Searchers, and Hollies drew upon American R&B and rock and roll to create an exciting new sound. All three members, guitarist Kevin Giragosian, drummer Kegham Giragosian, and upright bass fiddle player Craig Gigstad, take frequent turns on lead vocals. Gigstad tends to cover the more flamboyant performers like Presley, Lewis and The Big Bopper, while the Giragosian brothers harmonize on hits by The Everly Brothers and The Searchers. The songs no doubt trigger memories for older fans, but are generally well enough known to guarantee a party atmosphere for audience members of any age. Throw in a healthy dose of humor (particularly from Gigstad) audience participation, and solid musicianship, and it’s easy to understand why the huge crowd in Palatine was constantly clapping and singing along throughout the show. The Neverly Brothers announced that they'll return to Palatine for an indoor show at Cutting Hall next January. In the meantime, they have a busy schedule throughout the summer and plan to get back to playing clubs like Ballydoyle in the fall.